Add a dash of enchantment to weekend getaways or extended vacations … discover the Country Inn & Suites by Radisson. 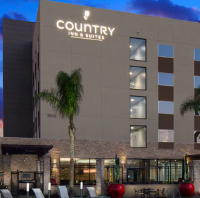 Offering family-friendly accommodations in a resort-style setting, this contemporary hotel is conveniently located in Anaheim within walking distance from Disneyland Resort. Hit the fitness center to kickstart your day, then enjoy a complimentary breakfast before lounging poolside or heading to the theme parks. It’s the perfect escape to relax, recharge and amp up your fun factor! The check-in time is 3:00 PM; check-out is at 12:00 AM.